Did you ever imagine getting your stories published, but you’ve just been too busy to get them done? It’s that sneaky word called procrastination. Procrastination can become a habit. We can get comfortable waiting for the right day, the right mood, the right feeling to rise up in our heart. We sabotage ourselves by putting dreams on the back burner for a “someday.” But you know, “Someday” isn’t a real day. It’s just a way of tucking our dreams in a bottom drawer, until they gather dust and crumble away. Don’t let that happen! I was guilty of the “Someday syndrome.” My children’s story came into my life unexpectedly, just as stories can do. There was a reason this story stayed with me for so long. I wanted to get published, but I also had to build my own inner strength first. My goal of raising environmental awareness and inspiring children to follow their dreams had to be bigger than my fears. I confess I’ve been a procrastinator for too long. But I learned I had to set aside my perfectionistic tendencies, set a date, and take whatever steps were needed to publish. I finally got published this summer. HOORAY! You can do it too. Here are the “behind the scenes” events that inspired my journey. In 1995, little did I know what would happen as the writer for a video project at The International Crane Foundation (ICF) in Baraboo, Wisconsin. It’s the only place in the world harboring all fifteen species of cranes. I was thrilled to go for a visit. Imagine stepping back in time. Cranes are prehistoric birds, and many stand as tall as people. From their large open pens, they look at you with beady eyes. Their heads lean back and their giant beaks open wide as they sing in a bugling voice, “Ker-LOO! Ker-LOO!” Their calls can be heard a mile away! There are over 200 acres of nature trails. Just walking around the pathways against a backdrop of tall grasses, you feel a deep connection with nature. Cranes have been a symbol of long life and good luck. They are beautiful creatures and prized across the world. To educate their International Marketing Managers about their environmental contributions at ICF, Amoco (now BP) sponsored this video project. It was a special day. Amoco was donating an outdoor Whooping Crane exhibit and many people were invited to the dedication ceremony. I was asked to interview the Amoco executives and Dr. George Archibald, a world-famous ornithologist and co-founder of ICF. Off-camera, George shared a personal story with me. And with that, I was hooked. It was a real friendship story between a man and bird. 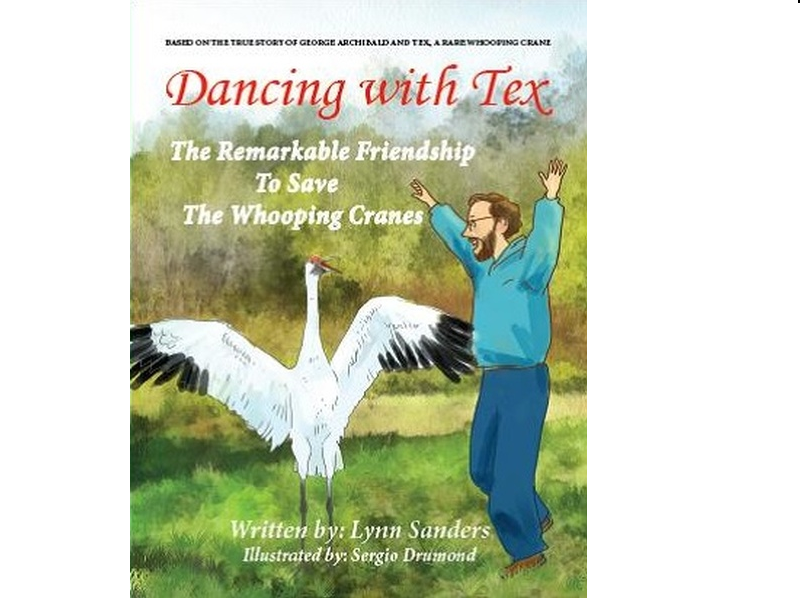 Tex, the rare Whooping Crane loved only people, and George, the scientist loved birds. Tex had been raised by Fred, the zookeeper at the San Antonio Zoo. Since Fred wanted to keep Tex safe, he brought her home and cared for Tex during her first 16 days of life, not realizing the impact on Tex’s brain. Without seeing other cranes, Tex’s brain was imprinted on people, especially men. That meant Tex believed people were her family, not birds. She shunned other birds. Scientists across the world knew that Whooping Cranes were on the verge of extinction. Every egg mattered! No one knew what to do to help Tex lay a fertile egg. That egg could help save her species. Since all cranes do a mating dance before laying an egg, George wondered if Tex would accept him as her dancing partner. After all, she loved men. George also arranged to get help from scientists who could give Tex injections to help produce an egg. In order to get Tex to like him, George moved his bed, desk and chair into Tex’s shed, and lived with her during the spring. Tex immediately bonded with George, and the dancing started the next morning. But it wasn’t so easy for Tex to produce a fertile egg. Many challenges came up, year after year. Still, George never gave up. It took six spring seasons until a baby chick finally hatched. The rest is history. It was such a compelling story. I knew it belonged in a children’s book. Did I know how to write a children’s book? No! Did I have many challenges? Of course! But did I quit? NO! Now, I’d like to help you move forward. If you’ve got a story that needs to be written and published, these tips will propel you forward. Be prepared to leap over the inevitable challenges. Be aware that when you tell the universe your intentions, obstacles will happen. And please know that your thoughts are the compass towards bringing your stories to life. Believe In Yourself – This is crucial! No matter what others say, or how long it takes, if your dream is big enough, you CAN do it. We all carry stories in our heart that need to be shared for a higher purpose. So, HOW do you believe in yourself? Consider doing daily affirmations in the morning and evening. Allow yourself from five to twenty minutes. Close your eyes, breathe deeply, and speak to a Higher Source. Think of positive statements in the present tense, and repeat them to yourself as you breathe in and out. Examples: ”I’m having a productive day today…” Or, “I’m grateful my book is being published this year.” Or simply, ”Thank you for guiding me forward.” You can also speak these words aloud. Repetition of positive messages reinforces your belief that you’re successful. Keep the Faith – Even though obstacles are inevitable, they also make you stronger. It’s up to you to know there is no turning back. I love the saying, “Winners don’t quit, and quitters never win.” The dream is never over unless you quit on yourself. I should know. It took me almost twenty years to publish my children’s story. Never Give Up! I can’t say this enough… Never, never, NEVER give up! Keep your dreams alive. Dreams are the stuff we are all made of. No one can control your thoughts. You choose what you think. So please, choose thoughts that make you feel good about yourself. Take Responsibility For Your Actions! It all comes down to consistent, persistent effort. Action is the final key. You’ve got to set your goals and go after them. No one can do that for you. If you don’t meet a goal, so what? Set it again. And again. Ultimately, if you’ve followed each of these steps, you will accomplish your objective. You need to believe, have faith, persevere, get help and keep taking action. Your success is waiting… just around the corner! Ready to go for it? Then set aside time every week to work on your own writing. P.S. News Flash! I’ve just set an audacious goal, and would be most grateful for your help! My next dream is to be a best-selling author on Amazon. If I don’t try, I’ll never know if it can happen. Thanks for considering to buy my children’s book, “Dancing With Tex” on November 28th. Together, we all achieve more!